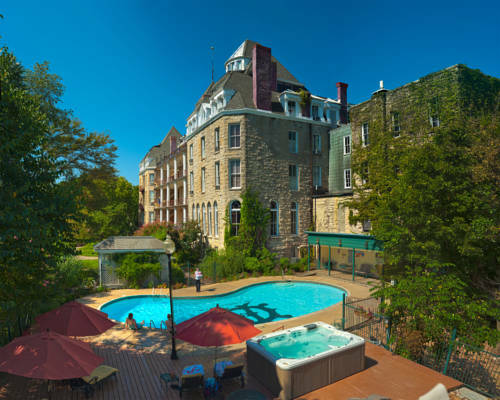 Perched above the Victorian Village of Eureka Springs the 1886 Crescent Hotel and Spa Arkansas Largest Resort Spa is a palatial structure that echoes the recuperative splendor of the surrounding Ozark mountain region. Architecturally significant the resort is the cornerstone to the nationally significant historic district and offers more than 100 restored Victorian shops restaurants and galleries. The hotel seamlessly retains its 19th-century character from the Victorian-Style Crystal Dining Room to the bold colors and antique furnishings in all guest rooms. A corporate museum occupies the humble town square spot where Sam Walton's Walmart began. See Sam's preserved office, his hunting boots, his favorite pickup truck, and his wife's wedding dress, among many other inspiring artifacts. ~26 miles from Eureka Springs. ~27 miles from Eureka Springs. Both have neon strings, and the banjo juts through a roof. ~31 miles from Eureka Springs.